SEO is one of the most important things which a blogger wants to learn in his/her life. Search engine optimization is necessary to get the higher rank of website’s post in search engines like google, yahoo or bing. So what’s the target of this post: This post will help you to ascertain search engine optimization types. It is the process of maximizing the number of visitors to a particular website by ensuring that the site appears high on the list of results returned by a search engine. So, everybody wants to improve their search appearance. But the main thing is that how to do it? Especially beginners have no idea how their content was affecting search engine optimization and some mistaken it by filling their article with keywords. That’s the biggest mistake they do. Even don’t fully trust the plugins which are designed to boost your SEO. Because most of them prefer keyword density up to 5% but from my experience its wrong strategy. Read these factors which affect SEO and rank higher in search results. On page optimization: It includes the factors like keyword density, heading, keyword placement, content quality and many other from blog post content. Read all on page SEO factors and details about how to improve it for better search ranking in search results. Off page optimization : It includes factors like domain name, keywords in main domain or sub-domain, backlinks, backlinks from related sites, .gov sites or .edu type trusted sources. 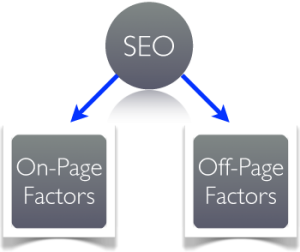 Read full details about off page SEO factors and how to improve it to get higher rank in google searches. These are the two types of search engine ranking factors which affect any page or post rank in google search results. Read full details of them & SEO writing tips to improve your post SEO & get ranked in top 3 easily.